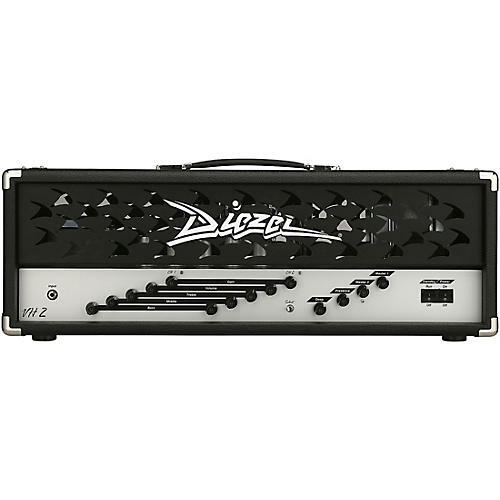 Rising from the firmly entrenched Diezel VH4 legacy, the Diezel VH2 100-watt head roars with the same detailed cleans, punchy mid-gain, and ferocious distorted tones that have come to define the Diezel name. Because some players found the VH4’s feature-rich layout more than their needs dictated, the VH2 has stripped away anything that could slow down your tonal journey. While all of the legendary tones are accounted for, the amp’s two channel design makes them even easier to access. Its two button footswitch takes on-the-fly tonal changes down to laser-like precision. And a single transparent series effects loop is ideal for translating all of your time-based effects. The VH2 packs 100 watts of all-tube Diezel tone into a straight-forward amp that demands to be experienced. The impossibly tight tones of the VH4 3rd channel are so revered that many players don’t see the need to use any of the amp’s other features. It’s with that in mind that we crafted the VH2. All of the best tones of the VH4, with nothing that will get in your way. The VH2 is crafted from the ground up to deliver legendary tone and flexibility in a simplified form. Nailing your perfect guitar tone has never been easier. Times, tastes, and tools change. But with the VH2, your tone never has to. One popular carryover from the VH4 is the dual master volume feature. With a push of the included footswitch, you’ll be toggling between two preset levels, ensuring you’re always heard over the mix. Dimensions: 29 x 10.75 x 11 in.